The Hubble telescope has bagged an unprecedented close-up view of one of the Universe's oldest known galaxies. Distance and age are linked in astronomy; because of the time taken for light to traverse the vast expanse in-between, we see the galaxy as it was more than 13 billion years ago. 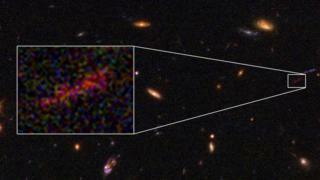 The detail evident in the image will help scientists to test theories of galaxy evolution. "Pretty much every galaxy at that distance is an unresolved dot... it's kind of a matter of luck to get a galaxy that's lensed in just the right way to stretch it out and get that much detail - it's a pretty nice find," the study's lead author Brett Salmon told BBC News. Dr Salmon, from the Space Telescope Science Institute (STScI) in Baltimore, Maryland, added: "By analysing the effects of gravitational lensing on the image of this galaxy, we can determine its actual size and shape." The findings were presented at the 231st American Astronomical Society meeting in Washington DC. Gravitational lensing describes the way light is bent as it passes around a massive object between the source and an observer. This creates a kind of cosmic zoom lens, amplifying the image of a galaxy in the background. In this case, a huge galaxy cluster not only boosted the light from the more distant one but also smeared the image of it into an arc. "The lens is not unlike the bottom of a wine glass, distorting that background image," said Dr Salmon. The more ancient galaxy is relatively small, having about one-hundredth the mass of the Milky Way. It may be typical of the galaxies that emerged a relatively short time after the Big Bang. One key question for astronomers who study galaxy evolution concerns the origins of "discs" - a key component of the large-scale structure of many galaxies, including the Milky Way. Galactic discs are flat, rotating distributions of stars, gas, and dust. Dr Salmon commented: "We don't really know how the first galaxies in the Universe assembled those nice rotating discs in those beautiful images we see. So when did those discs actually start to form?" Another study presented here at the 231st AAS meeting described evidence for rotation in galaxies that existed about 800 million years after the Big Bang. That rotation could be indicative of the beginnings of disc formation. Renske Smit, from the University of Cambridge, and colleagues, used the Alma array in Chile to show that the gas in these newborn galaxies swirled and rotated in a whirlpool motion, similar to the Milky Way and other, more mature, galaxies much later in the Universe's history. "We expected that young galaxies would be dynamically 'messy', due to the havoc caused by exploding young stars, but these mini-galaxies show the ability to retain order and appear well regulated," said Dr Smit. "Despite their small size, they are already rapidly growing to become one of the 'adult' galaxies like we live in today." Expanding on why this was potentially important, Dr Salmon said: "Once the galaxy settles into a disc, that sets in motion the rest of the evolution of the galaxy. So finding out when that turbulent phase starts to settle down is a key initial condition." Computer simulations suggest that discs could be present in galaxies up to 600 million years after the Big Bang. The galaxy discovered with Hubble could be one of the first to possess one. This object is right at the limits of Hubble's detection capabilities, but the James Webb Space Telescope should be able to provide much more detail. Nasa's Webb observatory is due to launch on an Ariane rocket in 2019. "This galaxy is an exciting target for science with the Webb telescope as it offers the unique opportunity for resolving stellar populations in the very early Universe," explained Dr Salmon.